J.S. Bach’s Sonatas and Partitas for solo violin are considered by many as the pinnacle of musical achievement, arguably the composer’s most demanding and emotionally penetrating works. After living with, reading about, listening to and playing these seminal works for over 30 years Gil Shaham offers a fresh and vital new perspective on these works, recorded in the summer of 2014, as part of his Artist-in-Residence with Symphonieorchester des Bayerischer Rundfunk. J.S. Bach has influenced every generation of composer and musician. Here Shaham’s insight and bold originality speaks to his willingness to take interpretative risks, while his innate musicianship and warmth – what Musical America calls his “special kind of humanism” – ensures that his performances bring out the partitas’ dancing rhythms along with their soul. ‘I find the music an amazing spiritual experience. There’s something very uplifting about this music’, says Shaham. For this recording he has decided on a ‘more Baroque set-up’ opting for a Baroque bridge, Baroque bow and 3 of 4 strings being gut. When asked what effect this set-up has on his interpretation Gil Shaham indicated that ‘it changes every stroke, but it doesn’t really change general ideas of interpretation. You can do everything with both sets of bow and bridge, although some things are easier with the modern bow, some with the Baroque one. The “small softness” (coined by Leopold Mozart) is easier with the Baroque bow. The tempos Gil Shaham has settled on in this recording are also quite different from what one might expect. Shaham takes inspiration from other works by Bach, as he explains; ‘if you compare the French minuet from Partita No.3, with say the minuet from a French suite, or even the famous ‘Anna Magdalena’ minuet I found myself asking myself wouldn’t it work better at the same tempo as the others? The Baroque bow is lighter and is easier to play faster. The deluxe 2CD package comes complete with Shaham’s insightful views on these works in discussion with former Strad Magazine editor Ariane Todes. 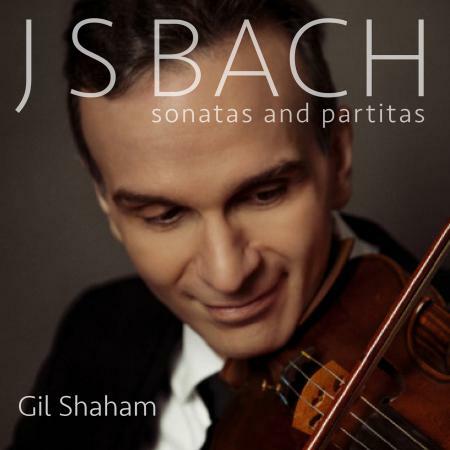 As you listen to this recording, it is easy to imagine that microphones were placed in Gil Shaham’s music room to eavesdrop as he amused himself playing through Bach’s Sonatas and Partitas. The result is a performance where, in some unexpectedly fast tempos, he revels in his left-hand dexterity. J.S. Bach’s Sonatas and Partitas for solo violin is full of fascinating details and insights. Shaham avoided performing these works for a long time, but now declares that “there is no greater joy than playing Bach.” This sense of joy does leap out at you from these performances, which are brisk and animated in superlative recorded sound. Shaham has thought long and hard about these works (as an essay in the liner notes confirms) and his technique is flawless. He has a particular gift for ending each movement: thoughtful, and in apt conclusion to what has gone before. 'Shaham opts for a more Baroque set-up with its distinctive timbre and lighter bow strokes, which wouldn't matter much if the musical approach wasn't so thoughtful, but it is. Shaham likes the way Bach's dance music swings with the slightly faster tempos... Musically I have been finding a lot to enjoy and admire in these performances... and quite serendipitiously a good choice for Bach's 330th birthday today.' Andrew McGregor, Presenter BBC Radio 3 CD Review. Gil Shaham talks with Boyce Lancaster from WOSU Public Media about his recording of J S Bach sonatas and partitas. "When you record your outgoing message on your answering machine, and then you hear it back you think - oh, maybe I should do that again. That's really how I feel about all my recordings." ...he never loses sight of the fact that this is, fundamentally, dance-inspired music - particularly so in the case of the partitas. It's all too easy to adopt a reverent playing style when tackling cornerstones of Bach's output, and the sense of fun can sometimes be a casualty of this. Shaham's great achievement in these works is to put the dance back into the music.